The Quick Access Recorder might not be intended to survive in a crash, but it’s still an expensive piece of hardware installed in an even more expensive aircraft, so this thing is still built like a tank. The case itself is best described as a metal shoe box: the bottom and sides have all been expertly welded together to create one continuous piece of metal, and only the top “lid” can be removed by loosening twelve captive screws around its perimeter. The front of the QAR has a handle and some locking tabs, so it looks like this device was meant to slide into an electronics rack of some type rather than being permanently mounted. There’s a power LED down at the bottom, but everything else is covered by a locking door during normal operation. Under the door is a slot for the tape the device stores its data on, status LEDs marked BUSY and READY, and an Eject button. Interestingly the Eject button is electronic rather than being connected to a physical mechanism, but it did help explain why the QAR arrived to me with a tape stuck inside of the drive. I was able to remove the tape from the QAR without too much trouble, but unfortunately it doesn’t provide us with a whole lot of information to go on. The label says it was put into the QAR on December 10th, but doesn’t say what year. It seems like the field all the way to the right is the registration code for the airplane: TFELM. Searching that does show a Boeing 737-300 with a matching registration still flying as of the early 2000’s, so that could be our donor bird. The tape itself is a 3M QIC Data Cartridge, and judging by the number of tracks and approximate vintage I think it’s a DC300XL which holds a whopping 20 MB of data. While antiquated now, it’s worth noting that much like modern QARs, the D50761 did use contemporary consumer-grade storage media. On the underside of the D50761’s lid, we’re presented with a gorgeous display of proper 1980’s engineering. Three separate boards are stacked on top of each other using aluminum standoffs, and are interconnected with a 64 pin ribbon cable. Helpfully, it even says what each one does right on PCB silkscreen. First up in the stack is the “Interface PCB”. This board accepts the inputs from various sensors and systems onboard the aircraft on the three black connectors, which travel through an array of resistors and ultimately to the various ICs which are in charge of decoding their signals. These include Motorola LM139J comparators along with a National Semiconductor UA9638RM and a Fairchild UA9637ARM which are RS-422 line drivers. The signals from these ICs then travel across the board to the Z8420AB6 parallel I/O controller and Z8470AB6 UART, which send their output to the next board in the stack via the ribbon cable. The middle board is the “CPU PCB”, which is home to the system’s 4 MHz Z8400AB6 CPU, Z8410AB6 DMA controller, and ten HM-6514 chips for a total of 5 KB of SRAM. This board also has three UV EPROM chips which contain the computer’s software. It’s interesting to note that unlike the other boards, the “CPU PCB” has no connections to the rest of the system other than through the ribbon cable. Finally we have the “Formatter PCB”, which takes the data from the Z80 computer over the ribbon cable and writes it to the tape drive. 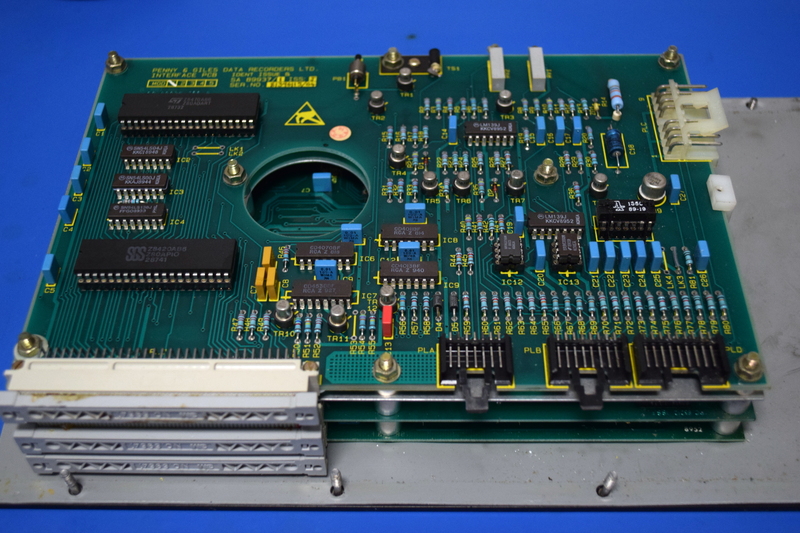 This is the only board that has a connection to the tape drive itself, and contains two more Z8420AB6 parallel I/O controllers and a large array of Motorola SN54LS04J hex inverters. 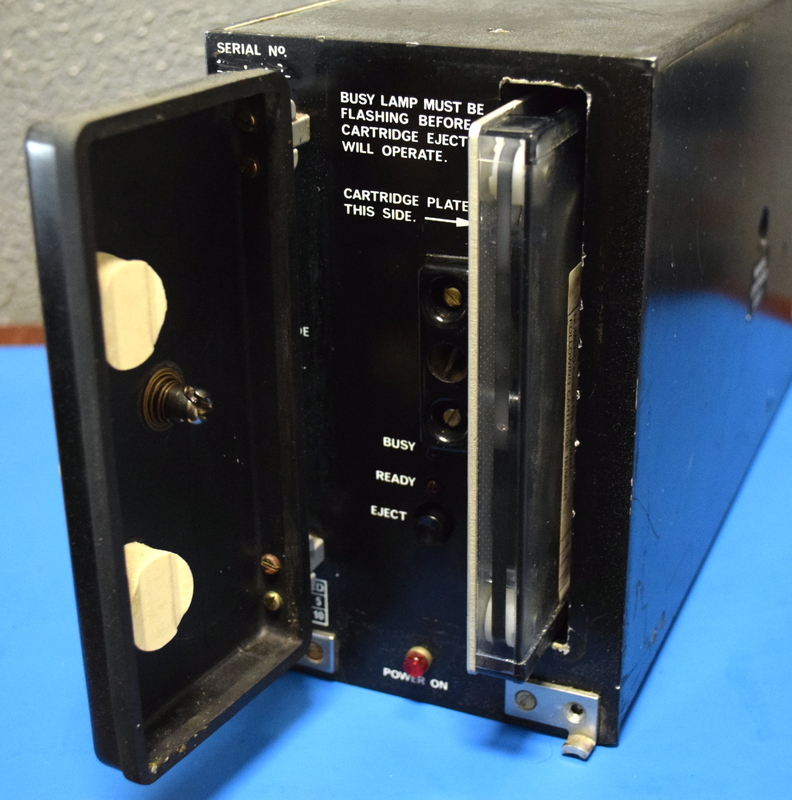 The discovery of what is essentially a complete retrocomputer inside of this piece of equipment reminds me of the AH-64A Apache data entry panel we looked at previously. Though in this case I am surprised to see a lack of conformal coating, or even much in the way of vibratory protection. Obviously military hardware will be built to the highest possible standards, but considering this device was designed for life in a commercial airliner, the control electronics still seem quite pedestrian. As fascinating as the control section is, the tape drive is arguably the star of the show. Taking up nearly all of the available volume inside the D50761 it’s a massive piece of gear, especially to modern eyes. It’s also built quite differently than the control section, as here we see not only a much denser PCB layout, but the conformal coating and vibration considerations that were absent in the other boards. On the surface it seems odd that these two components would be built so differently and still be packaged in the same device, but it could be that Penny & Giles designed the tape drive itself to higher specifications so it could be sold to the military. It would simply get paired with lower grade control electronics when it was sold for use in civilian aircraft. In any event, the tape drive is a marvelous piece of engineering. 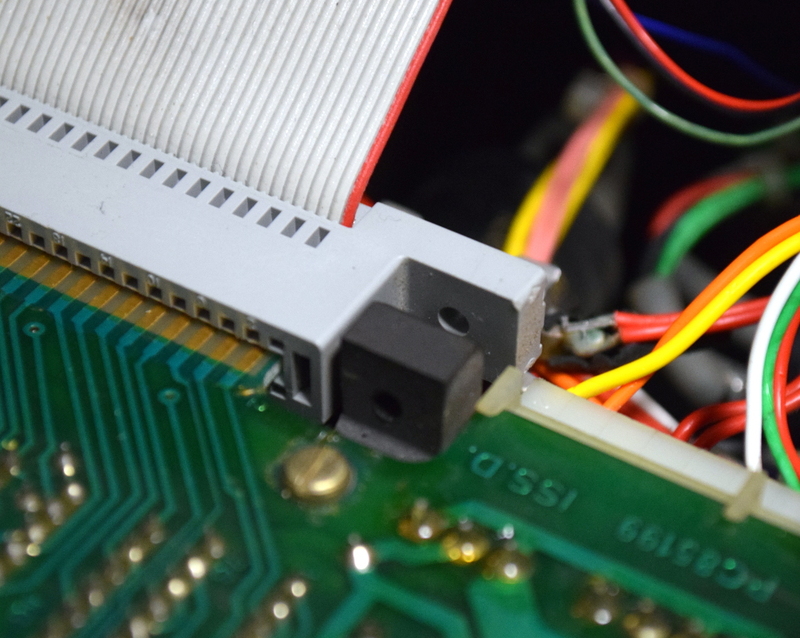 Two boards, called the “Drive & Control PCB” and “Read/Write PCB” are mounted on hinges at the back of the drive, so you simply need to remove two screws at the front and fold them down for easy access. It’s a shame that electronics actually designed with testing and repair in mind are such a rarity today. Locking connectors, conformal coating, and hot glued adjustment potentiometers. The rest of the case is taken up by the power supply, which features a fairly monstrous coil in addition to some beefy capacitors. There’s also an LM123K 5V 3A regulator which seems to be responsible for powering the control boards. Interestingly, there’s what appears to be a battery backup of some type on an elevated “shelf” over the primary power supply. One of the cells popped and unfortunately corroded things pretty badly, but judging by the silkscreen on the PCB it can provide 5V and 12V to the D50761, at least for a little while. It doesn’t seem like these handful of cells could keep the power hungry tape drive running for any considerable length of time, but perhaps it’s just enough to allow the QAR to record the fact that the system has run out of power before shutting down. Alternately, it could be there just to help the D50761 coast through momentary power fluctuations. In general, I was surprised with how inconsistent the design and construction of the D50761 QAR is. It seems like a mishmash, with some components looking to be held to exacting standards and others bordering on an afterthought. The tape drive itself is a marvel, but the power supply behind it looks like ancient technology in comparison. The layout of the control boards is simplistic to the point of appearing amateurish. Some connectors are secured against vibration with strong locking clips, and others are simply pushed on. The “battery backup” (for lack of a better term) especially looks like something that was tacked on in a later revision of the device, and the fact that there was no provision to protect the D50761 in the event of battery rupture seems exceptionally ill-thought-out. Of particular note was the edge connector for the tape drive. Even though both the drive and the connector itself had holes which were clearly meant to run a fastener of some sort through, none was used. This edge connector is so lose that I could remove it with a single finger, and it baffles me why they wouldn’t have secured this connection even though it was clearly designed with this in mind. In truth, I’ve been looking for a “real” Flight Data Recorder to do a teardown on, but those don’t seem to float by on eBay very often. At least not at a price point that is compatible with cracking it open in the name of knowledge, anyway. The search is still very much underway, but this D50761 QAR popped up and I thought it might serve as a stand-in for the interim. As it turns out, this was an intriguing piece of hardware to look at in its own right. While not as robust as a true FDR, the D50761 gave us a fascinating look at what was essentially very high end consumer hardware for the era. It would be interesting to hear from any readers who might have experience with more modern QAR systems to compare their contemporary build quality. We’d also love to hear from anyone who might have actually used one of these recorders in its prime. If you’ve got ideas for interesting pieces of hardware you’d like to see laid bare, don’t hesitate to drop us a line. Maybe the connector wasn’t tied down because someone got there before you. Maybe they saw the battery leakage, decided it wasn’t worth repairing. Then they reassembled it without replacing ties or snaps that they had to cut off along the way and then sold it to you via eBay. It was probably bought from a component repair shop that decided it was only worth spares/parts, and sold it on as scrap, or even put it on eBay hoping someone like the OP would snap it up for a few extra bucks. It’s quite common for this kind of equipment to be sent in for repair or refurbishment, and then either deemed too out of date by FAA rules or beyond reasonable repair based on age or damage. When they put it back together before scrapping it or reselling it, they rarely take the same time and care to repackage it in the same way. At any rate, QARs are hardly critical flight equipment, so that makes it far less problematic if the device lacks the features the author said they expect to see in aircraft equipment. So they put the whole thing back together, minus a single fastener? I suppose it isn’t impossible, but doesn’t really make much sense either. You’ve never reassembled “anything” without finding an extra part on the bench when you’re done? Having worked in a very closely related industry (a SaaS provider for the compliance and maintenance side of the airline industry), I have direct experience with the procedures regarding QARs, and the data retrieved from them. They are not considered serviceable parts, so they are checked for function and replaced if not working. They are also replaced a regular intervals, depending on the model (typically because of the battery). FDRs are similar, though there are more stringent procedures regarding their replacement, due to the liability involved should that be done incorrectly. Maybe you are ASSuming the QAR came directly from an A/C, and not from someone down the chain, such as a surplus retailer? Someone, perhaps, that is not certified, because there was no likelihood the QAR would ever return to service? @Inqisite: When piece is considered scrap, nobody has to bring it back in working (“airworthy”) condition. Normally it isn’t even possible to do so, otherwise it would not be scrap. If the fastener was a cable tie, then it was snipped. That could be an awesome project box for you when you are done exploring the previous internals! I’ve been thinking something very similar. Would make for an awesome backup/NAS enclosure. Just be careful doing the same with an FDR if you can find one. They’re often lined with asbestos for fireproofing. That’s an interesting mix of parts. I would not expect to see card edge connectors and IC sockets in something intended for aircraft use. I’m sure the tape itself had a limited operating temperature range, yet there are military temperature rated chips in it. Maybe they had a large stock of chips from military equipment? It strikes me that like most other things in aircraft equipment, durability is first in mind. As to the edge connectors, that’s not actually unusual. The black box I own used them. After all, any serious shocks to the device would’ve also likely meant large shocks to the aircraft itself, and that would require all manner of inspections and repairs. Not to mention, the FDR like most other critical flight equipment is part of the checklist testing prior to each flight. The tape likely didn’t see temperature extremes (at least none that it was expected to survive, unlike an FDR). A QAR is meant to be accessed quickly and easily, and the data moved to an external device for easy analysis. Many years ago and a few minutes before departure on a 757 a large number of cockpit lights failed to illuminate when the test switch was pressed. It was a strange pattern of failures and I thought it was going to turn into a cancellation. Mechanic came, pulled out an edge connected circuit board from a set just aft of the copilot, cleaned the connectors with an eraser, reset the card and voila – good to go. Was that eraser certified by the FAA for use in A/C maintenance? Manufacturers decide what tools are acceptable for use on their components. Many electronic manufacturers will mention a pink eraser and yes, it’s an acceptable tool when used IAW manufacturer’s recommended maintenance practices. But they probably specify acceptable erasers. I am not sure if erasers exist, which contain silicone polymers, but they for sure would not be acceptable for use on contacts of any kind. Im curious if there is any data op that tape cardridge! 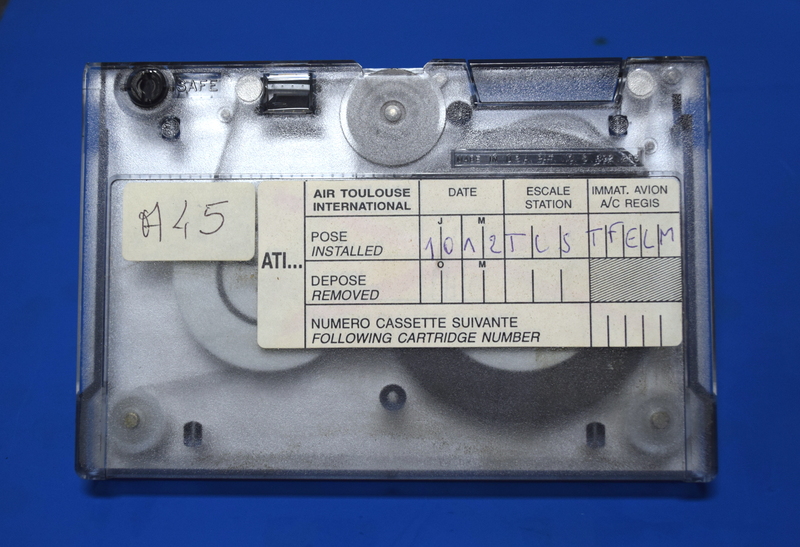 Can these tapes be read? Maybe by another player or maybe by the QAR itself? I’m no expert in data storage on tape, but I guess that reading the sound of this tape and processing the audio stream may yield the data? The control boards were military grade 54xx TTL, CD4xxxBF ceramic DIP and 1xx analog parts mixed with commercial grade Z80 related plastic DIPs. Maybe a reuse of a military design that was upgraded in performance with Z80 but built to commercial standards rather than military specifications? I don’t know if it was a reuse of a military design, but it would make sense to someone designing a device for civil aviation to use parts with military ratings (temperature range for instance). That makes me want to get back to my own black box (FDR) inspection and teardown project. 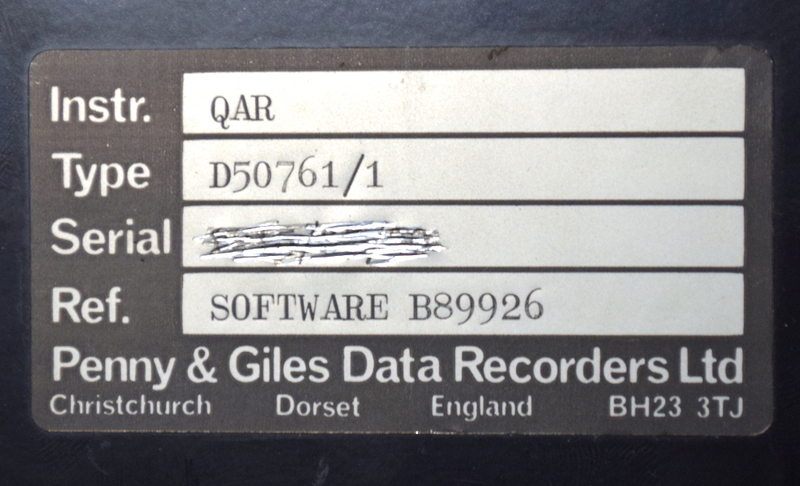 – A step up from this tape-based recorder are QAR’s using Magneto-optical discs for storage. 230MByte of storage! What would be neat is if the CPU board can be hacked to be a general purpose CP/M system. Boot the OS from EPROM and connect to a floppy, display, and keyboard via the I/O bus it has with the ribbon cable. How much RAM is on the CPU board? Boot it from the QIC? I think old Sun workstations could do that. Why would they use an unfastened edge connector? Maybe so they can make a ton of money on a simple repair service or selling you an exchange part. The timing of this blog post is pretty interesting because just today at work (I’m several months into my new gig as an avionics tech) I saw one of these: https://www.l3aviationproducts.com/products/micro-quick-access-recorder/ attached to a connector along the co-pilots arm rest side panel. I asked the lead tech what it was and he wasn’t really sure, and said he never had to mess with one. Alas! I now know something he doesn’t. Last week I was looking up ARINC 429 TX and RX chips. It has a fairly simply phy layer (other than detecting out-of-bounds signal rise times), but unsurprisingly, the few manufacturers that make such components charge ridiculous amounts for them (like $50 for a single channel tx or rx). The physical layer may be fairly simple, but link layer and protocol layer and EMI requirements are not. Take a look at this spec sheet some time and you’ll understand why (in a quantity of one) it costs so much. But 500 and the price will go down. What I looked at were actually line drivers/receivers, which as it turns out, do even less than I expected. That datasheet says virtually nothing about the protocol (which from what I’ve read a little bit about seems overall quite simple except for maybe data block transfers). EMI rejection from what I can tell is primarily done by differential signaling RTZ with voltage swinging at levels on the higher side for a serial bus. waveform shaping and bound checking and simple parity checking. Then of course there’s shielded twisted pair with the shielding terminated to ground on both ends. It really doesn’t seem *that* complicated (which makes some sense given its age), but it is a specialty protocol that doesn’t have the broad usage of something like CAN. Tom, if you’re in the NYC area, I have an older (probably 1970s vintage) FDR. I’m a little bit of a newb and lack the hardware to do any serious testing, but if you’re interested in meeting up and exploring the device, I’m happy to cart 22 lbs of steel with me. I like the idea that a floating detachable FDR is now being built into new A/C.